Notes: The new refinery at Fawley was opened on 14 September 1951. 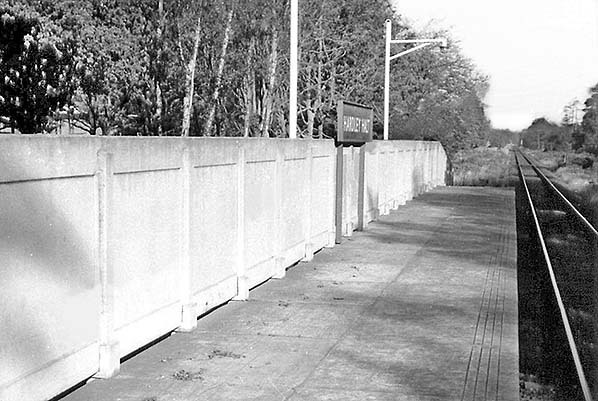 As it was a mile to the north of Fawley station a new workers' station called Hardley Halt opened on 5 April 1954. Although available for the public to use the halt didn't appear in public timetables. 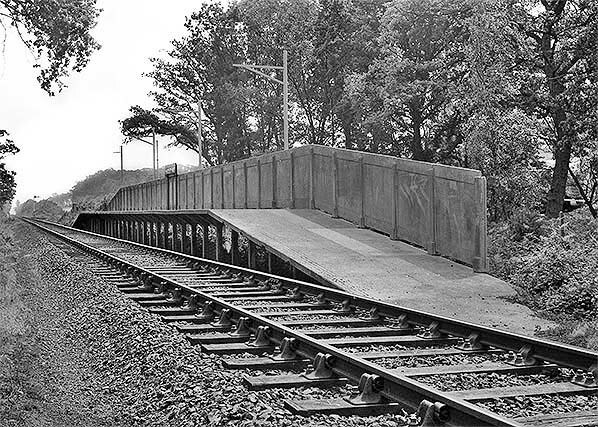 The halt comprised a single re-enforced concrete platform on the up side of the line. There was a concrete fence at the rear of the platform which was lit by three tall concrete lamp standards. Access was along a short path from Cadland Road which had a further two lamp standards. There was no shelter or seating on the platform just a centrally placed BR Southern Region green name board. Tickets from Michael Stewart and Brian Halford. Route map drawn by Alan Young. BR timetable from Alan Young. Click here for a brief history of the Fawley branch. Last train to Fawley oil refinery. BBC South Today Facebook page - includes film of the last train at Fawley (2½ minutes) - You don't need to subscribe to Facebook to see this. 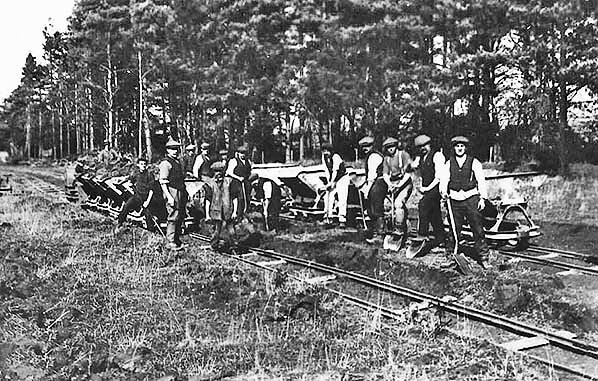 Construction of the Totton, Hythe & Fawley Light Railway, better known as The Fawley Branch, underway at Cadland Woods close to the site of Hardley Halt. Construction is in the early stages so the period will likely be early 1924. At this time, mechanised plant existed but was still somewhat in its infancy and especially where internal combustion power was concerned. Thus the work seen here was still very labour intensive. Employment was something of a volatile subject in this post WWI period and Britain was destined to be embroiled in the global event which came to be known as the 'Great Depression' of the 1930s. 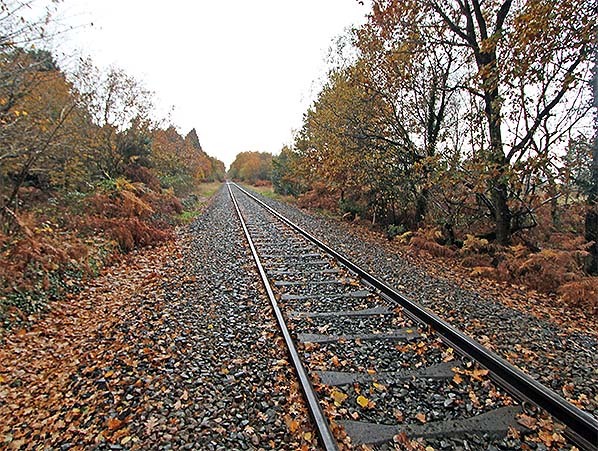 Clearly seen is narrow gauge contractor’s track, sections of which are somewhat lacking of sleepers and appear incapable of taking the weight of loaded skips. Sleepers appear to be of steel. Typically this track was of what was and still is referred to as being 2ft gauge. More correctly it is 1ft 11⅝in gauge to the nearest imperial fraction and, in fact, is 60cm gauge. A number of the ubiquitous side-tipping hopper wagons are present; when heavily loaded these wagons required care when being tipped as they were prone to lifting off the track and overturning. The tipping mechanism was released by a lever on one end of the wagon. Contractor’s track was of a temporary nature and usually consisted of prefabricated track panels which could be easily and quickly lifted and relaid as work progressed. The track seen here and perhaps also the wagons were very probably ex-War Department. Casting a sharp eye to the left of the picture reveals the presence of a small locomotive. Even on a larger version of this image little of it can be seen but fortunately enough is visible to enable identification. It is a bow-framed, cabless Simplex (Motor Rail & Tramcar Co, Bedford) dating from WWI and of the type known as a 'Trench Locomotive' or 'Trench Tractor'. Probably of 20 - 30hp, it could have had either a petrol, probably a Dorman, or diesel engine by this time. These little locomotives were crude but rugged and reliable and numerous examples can still be seen spluttering along to this day, albeit now mainly at working museums and narrow gauge heritage railways. 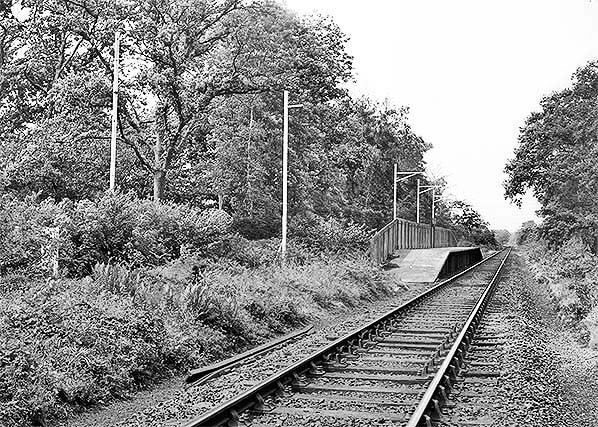 Looking north west at Hardley Halt c 1960s. The gate in the hedge at the end of Cadland Road can be seen on the left. The path ran in front of the hedge with passengers climbing up the ramp to reach the platform. Facilities at Hardley Halt were very basic with just a station sign and lighting. 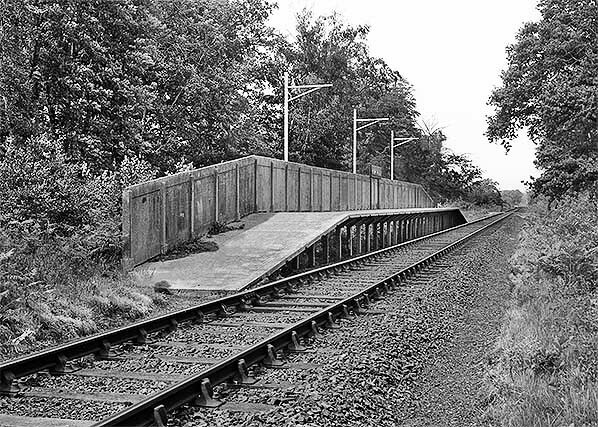 Hardley Halt looking south-east c1960s. 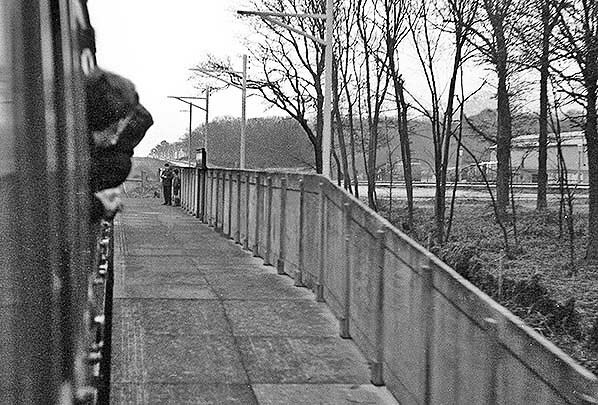 Looking north-west along the platform at Hardley Halt c1960s. What is probably a railtour is seen at Hardley Halt c1960s. The proximity of Cadland Road is seen in this view.